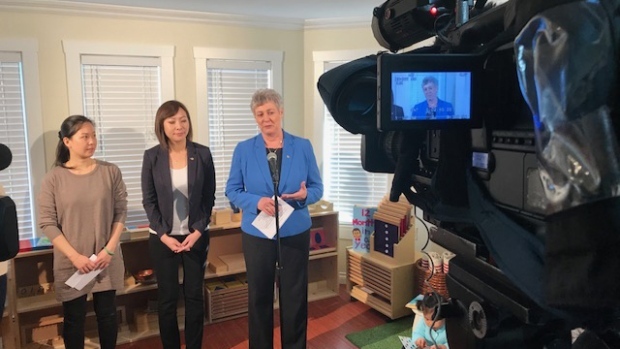 British Columbia's government announced the creation of more than 400 new child care spaces Tuesday as part of a program aimed at helping unlicensed facilities become licensed. In total, the province said 426 additional in-home spaces are now available thanks to funding from the Childcare BC Start-Up Program. The now-licensed centres are located in Abbotsford, Chilliwack, Burnaby, Coquitlam, Delta, Langley, Richmond, Vancouver and more than 20 other communities across the province. "We're thrilled that so many unlicensed providers are pursuing licensing," Minister of Children and Family Development Katrine Conroy said in a statement. "This means that hundreds of children throughout the province will receive high-quality, licensed care through startup grants alone." The program works by providing up to $4,500 in funding to help unlicensed child care centres become licensed through their local health authority. According to the province, the money can be used for training and applications, hiring staff or purchasing equipment necessary for the facility to meet provincial standards. The new spaces are an addition to the 1,600 that have already been created through the province's New Spaces Fund. Premier John Horgan ran on a campaign promise to overhaul child care in the province. The 2018 budget earmarked $1 billion to create additional child care spaces and offer monthly benefits to as many as 86,000 families. The NDP also promised to explore a publicly funded, $10-a-day child care system. CTV News learned back in November the province was testing the model at some 50 child care centres as part of an 18-month pilot project, but little has been made public about the program since. Is your child care provider approved to offer you a discount?